This is the final card for John Tsitouris (#523). 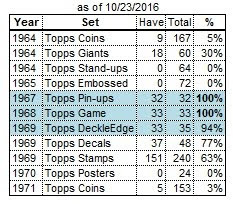 He had cards in 1960, '63, '64, '65, and '66, but not in 1967 (so he also qualifies for my "Back on Topps' Radar" series). 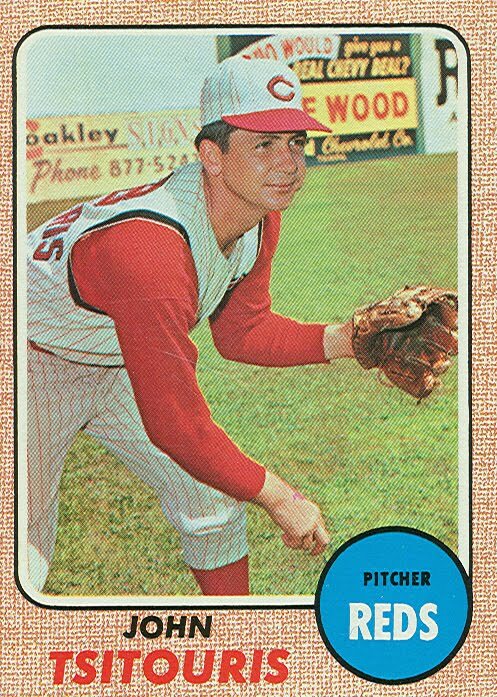 In 1967, he appeared in a grand total of 2 games (for 8 innings), so I also wonder "Why does he have a card?" 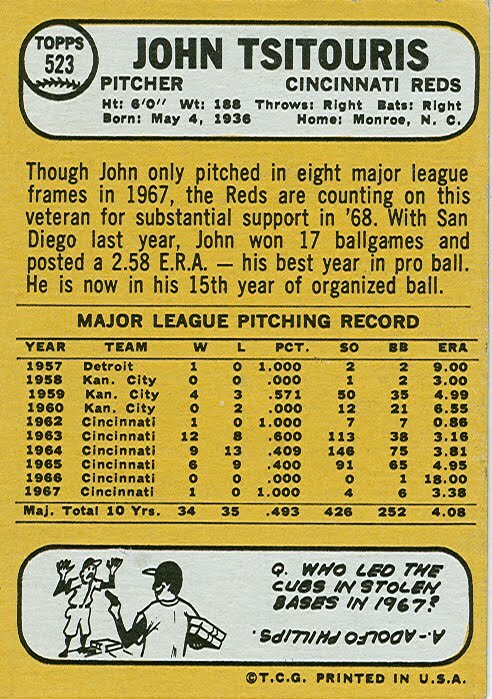 John began his minor-league career in the Tigers organization in 1954. His major-league debut came in June 1957 with the Tigers. After the 1957 season, Tsitouris was traded to the Athletics in a deal which involved TWELVE other players. The most notable of those were Billy Martin and Gus Zernial, who went to the Tigers. Prior to the 1961 season, he and pitcher John Briggs (not the Phillies outfielder) were traded to the Reds for pitcher Joe Nuxhall. However, he spent the entire 1961 season and much of the 1962 season with the Reds' triple-A team (Indianapolis in 1961, and San Diego in 1962). 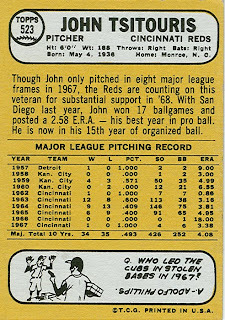 John's big years with Cincinnati were 1963 to 1965, where he made 30 or more appearances each year, mostly as a starter. 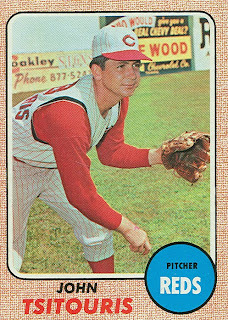 Near the end of the 1964 season, his 1-0 shutout of the Phillies began their 10-game losing streak which cost the Phillies the NL pennant. 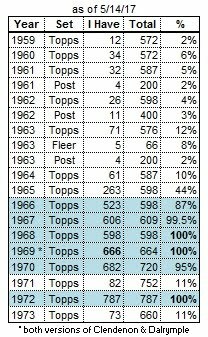 His final big-league game was on April 24th, 1968. Over his entire career, he played 149 games in the majors and 196 games for triple-A teams. A strange bit about this card - despite the player being a Red, the trivia question on the back concerns the Cubs, contrary to established practice for this year's set. How many other cards from this set share that ignomy?